Greenacre Properties, Inc. (GPI)'s accounting team will prepare monthly financials and coordinate the preparation of your association's year end financial statement. The accounting team will provide your board with balance sheet, income statement, general ledger compilation report, delinquent report and prepaid assessment report. Because of GPI's reputation in the industry, your CPA will price the preparation of your annual financial statement based on their knowledge that GPI will provide all the information that they need in perfect order – meaning further savings to the association. 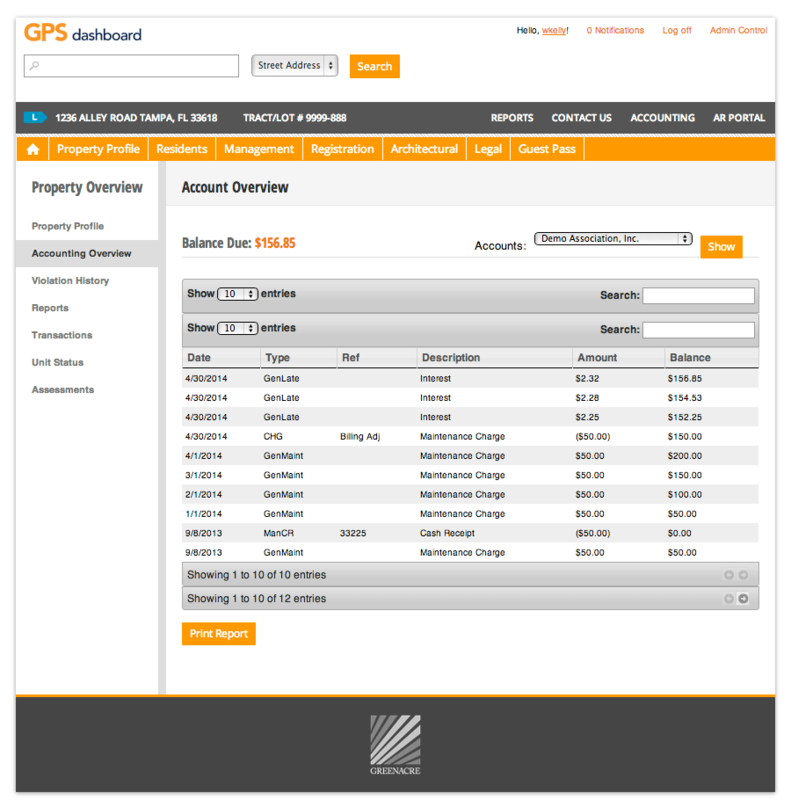 GPI will help make it easy for your board by putting the financial information you need at your fingertips. You and the other board members can view key A/R information online—prepaid/past due reports, aging balance reports, and even print the association owner master list. 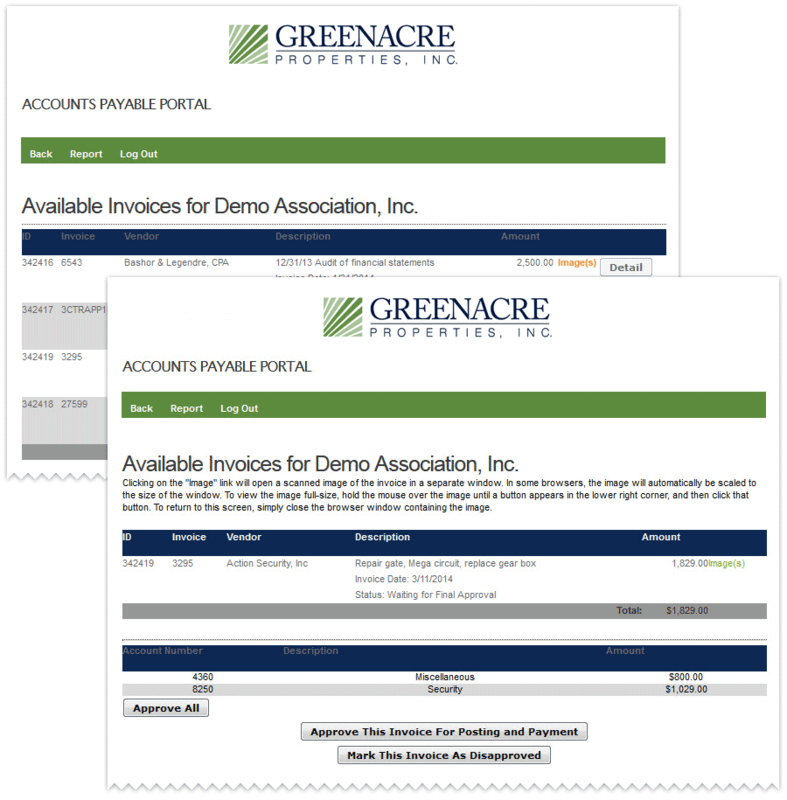 Greenacre's proprietary online payables system will let you and the other board members see the status on any invoices and the related documentation in the board's section of the web portal. Once the board authorizes a payment, GPI will print and mail the check the same day from our main office. All historical A/P information is also accessible at any time for research and comparison abilities. Our licensed community association managers regularly inspect properties to ensure that deed restrictions and rules are followed, that maintenance and repair work is done as contracted, and that your community's assets are being maintained. GPI managers use a smartphone application to document violations that allows a letter, with a date and time stamped color photo, to be generated with the push of a button when the violation is observed. Letters go out the same day. Managers will provide written monthly management reports to the Board of Directors concerning management and operation of the Association and the community facilities, detailing the recent activity, events and business of the Association. Managers will assist with developing contract specifications and obtain bids for specific projects as requested by the Board of Directors. Greenacre will observe work on specific projects during routine property inspections and update the Board. GPI will prepare a proposed annual operating budget with fully funded reserves that meets the requirements of Florida Statutes and your association documents and reserve study. GPI community association managers will respond promptly and courteously to concerns. GPI's assistant community association managers are also licensed and available during business hours to take calls and assist homeowners. Managers and assistant managers both play a large part in assisting owners with the architectural approval process. They both work closely with the board and committees to make sure the process is handled smoothly and efficiently. GPI community association managers also coordinate community requests with government agencies and assist boards in writing bid specifications for specific projects. 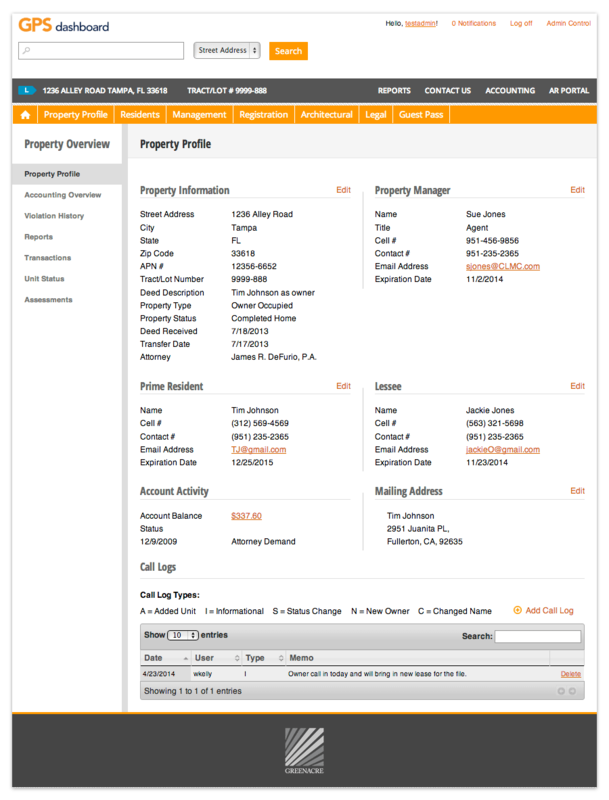 GPS Inspect reduces the time spent in creating and tracking deed restriction violation letters and work orders by more than 80%. Most managers use a legal pad and a digital camera. Violations can be observed by the manager or called in by the home owner. In either case, GPS Inspect automatically creates the right letter with the right content (including a picture) in minutes. This is why our process can reduce your admin's staff time by up to 25%. 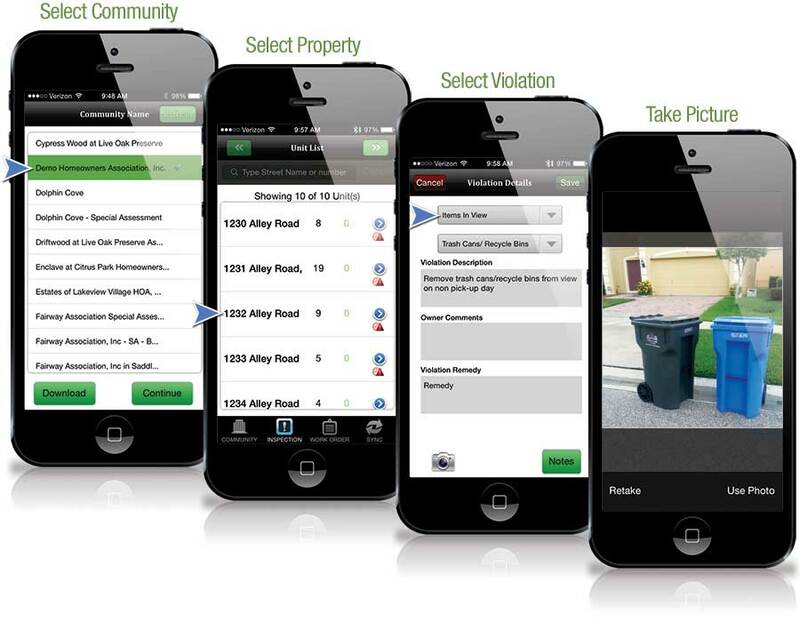 Managing Community Violations with your smartphone or tablet. 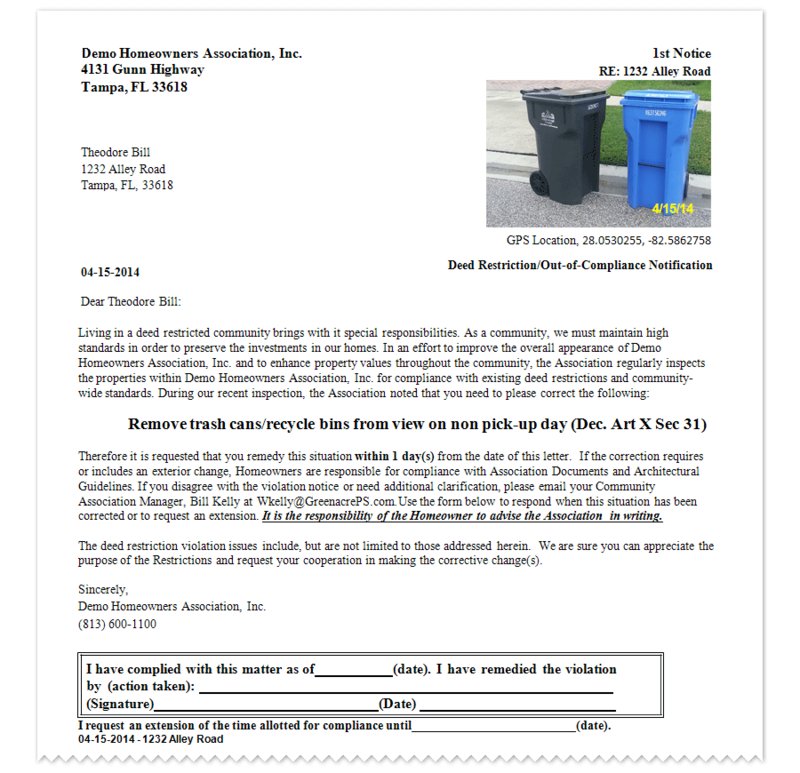 Deed Restriction Violation Letters incorporate a picture of the violation and GPS location for the Home Owner's convenience. Provide Members and Directors easy access to current accounting and association information via GPS web server platform. With these web services provided, members could have up to the minute real-time access to account balances and have the ability to pay their assessments on-line via credit card. Also, Board members could have access to financial reports online. 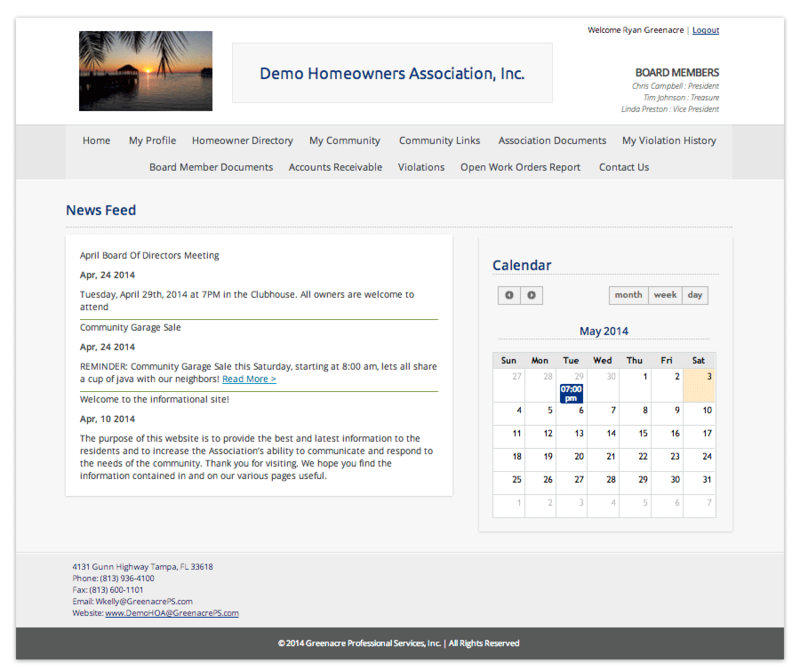 Keeping Track of your Community's information with our dashboard will support your home owner's needs. You can use our standard dashboard or have us customize a version for your Community. Review Account Balances or Violation History Quickly! We offer your board member training on their roles and responsibility in which they have been elected to. Our online training programs will support the Managers with new ideas and concepts for your community. Eliminate stacks of paper and transform the most important data from your documents into actionable digital information. Store, search, view and collaborate on documents securely online using our easy web-based storage and retrieval solution. Once you document a violation using your smartphone, we will do the rest. We will print and mail the letters and will look to the homeowner as if they came from your office! Our record storage is in the same building as the accounting staff, for ease of support to any older file needed by your community. Prepare, inspect and collaborate on documents in our climate controlled records storage area. GPI mails coupon booklets to owners to use in making maintenance fee payments. Owners mail their payments back to the Association lock-box. Our mail room can support all other mailings required by your Association. We create and develop a new beginning for your facility. Operation services include: renovations, start ups, pre-opening services, budget management and staff training. GPI will develop facility and pool maintenance management guidelines, including energy savings programs, maintenance and repair assessments for the entire facility. Greenacre Realty Services began as a value added service to our association clients, crafting solutions to complex delinquency problems during a significant economic downturn. Since then, GRS has grown into a full service real estate brokerage operation with an array of capabilities to serve condominium and homeowners associations, individual unit owners, and investor owners of all types of property. In keeping with Greenacre tradition, our financial management systems and back office support are second to none. We look forward to showing you how we might be of service. Over its many years of managing communities throughout Florida, GPI has been able to benchmark utility costs. GPI community association managers may be able to help your board reduce your association's power and light costs substantially. Many of our associations have received refunds from utilities because of an auditing process arranged by GPI. Our integrated bank and lockbox solution eliminates errors and ensures timely deposits of funds into a dedicated checking account in the association's name. With the use of GPI's automated bank and lockbox solution, the cash flow of the Association is well managed.